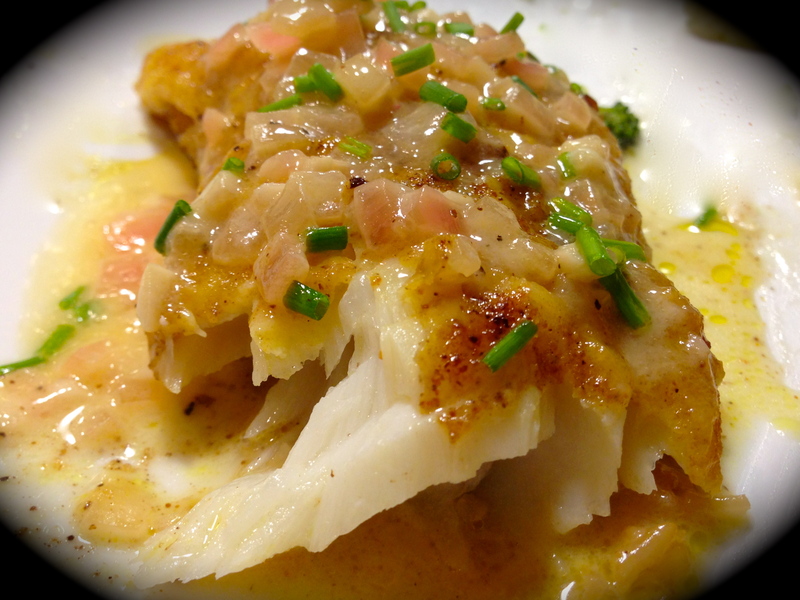 Pan Fried Cod With Lemon Butter Sauce… – You Betcha Can Make This! My husband and I have gotten into eating more fish lately and so I’ve become a student of preparing fish. Baking, broiling, grilling – you name it, I’ve been trying it. I will be the first to admit fish is tricky and the only advice I can give is to keep making it until it becomes more intuitive. Don’t be afraid to flip it back on the heat if you find it is not cooked through. I would much rather do that than serve overcooked fish. You can’t take that back. Preparing fish in an art that comes about from trial and error. But I guarantee its worth the blood, sweat and tears. Lately I’ve made a lot of fish filets, mostly pan frying them and I think I’ve got it to the point where I’ve learned how to judge when the fish is cooked. Normally I try to buy a filet that is between a 1/4 and 1/2 inch thick. That way I know that about 3 – 4 minutes on each side under medium high heat will do the trick. What’s great is grocery stores are now stocking more fish both fresh and flash frozen. The filets I’ve been buying are flash frozen and shrink wrapped and I find they thaw and cook beautifully. The only fish that I’ve tried a fews times that doesn’t seem to hold up well in this process is swordfish. Regardless of what I do it always seem to turn out tough. So if I plan on serving swordfish I buy it fresh. Otherwise fish like, grouper, salmon, cod, flounder, halibut and the like all seem to hold up well being flash frozen. It’s a great convenience when you decide at the last minute that you want to make fish for dinner, which was the case with me last night. Recipe Rating – A: I’ll clue you in, the first few times I tried recipes like this the results were not nearly as good. As I mentioned earlier, preparing fish is something of a acquired skill. The only thing I will tell you is to err on the side of undercooking versus overcooking. That way you can always flip it back in the pan if need be. I would also advise that if you are not a seasoned cook to avoid serving fish at a dinner party. Be patient. Wait until you’ve mastered the skill of preparing fish before you venture into doing that. Don’t set yourself up for failure. And don’t let what I’m saying make you shy away from fish. It is definitely worth it to master this skill! 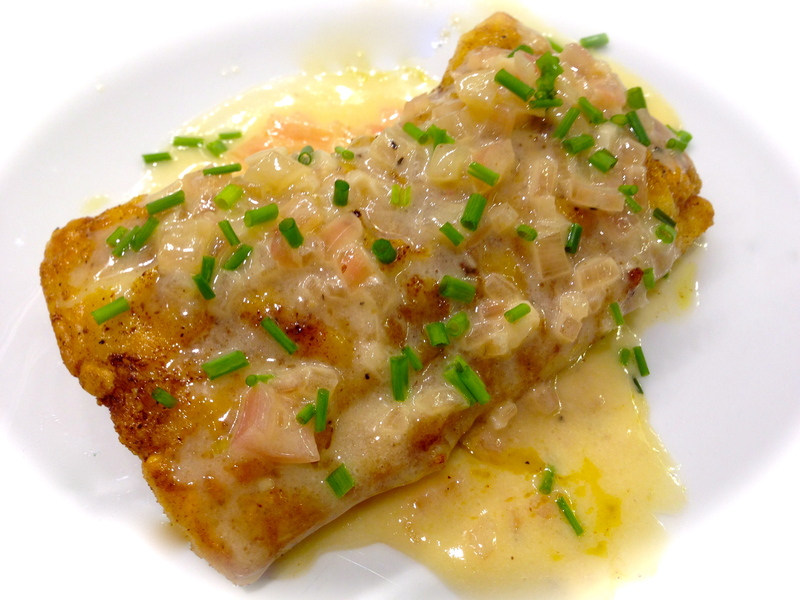 Lesson Learned 1 – Preparing the fish: This recipe has a very simple preparation for the fish. After the fish thawed and I removed it from its shrink wrap, I took paper towels and dried the fish thoroughly. Then I dusted the fish with flour on both sides and seasoned it. This time I used a Penzy’s seasoned blend called “Forward”. The blend consists of black pepper, onion, paprika, garlic, turmeric and spice extracts of celery, rosemary, thyme and basil. Although it sounds like seasoning overload, the blend actually created a nice all-purpose seasoning and it worked well with the fish. Don’t be afraid to experiment here. What I do is open my seasoning blends and smell them. I can tell by the smell what might overpower the fish. A nice all purpose blend works well to compliment the taste of the fish, as it did in this case. 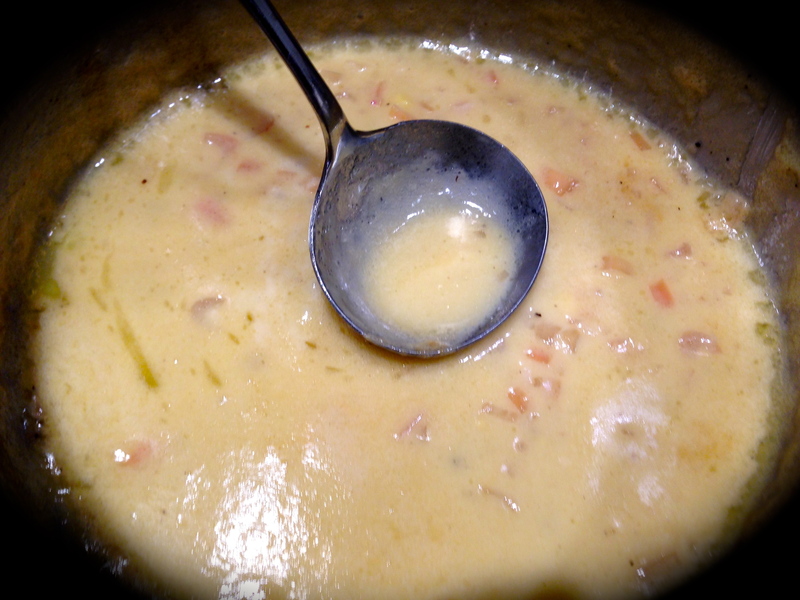 Lesson Learned 2 – Making the butter sauce: I have to admit making this sauce was rather easy. I discovered that starting it about 15 – 20 minutes before serving works well. 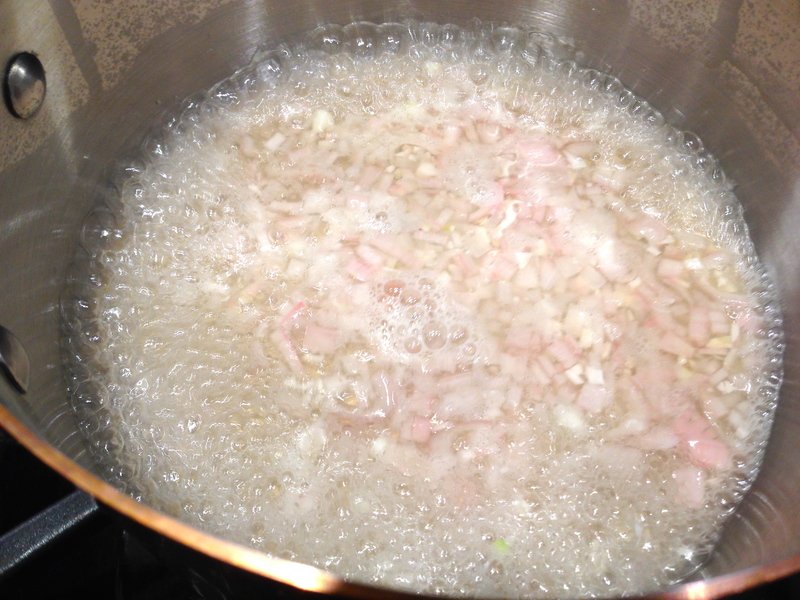 I found it interesting that you sauté the shallots, and garlic in wine and lemon juice without using any oil or fat. You add heavy cream and butter near the end. At one point you are making the sauce while simultaneously cooking the fish, but at that point you’re only doing the finishing touch of adding the butter to the sauce, so it’s easy to multi-task. You can also make it ahead, just make sure to keep it warm on a very low flame. This is a very rich sauce. Be careful. You only want to add a little to the fish. You don’t want the taste of the fish to be lost in the sauce. Add just a little and you will have a decadent delight. The recipe below is more than enough for two people. You can easily double it if you plan to serve more people. Lesson Learned 3 – The power of garnish: I’ve said this before but it’s worth repeating. You eat with your eyes first. I can’t tell you how many times I get comments like, “that looks delicious!” Now I can understand how something tastes delicious but I’m not sure how delicious can be determined by your eyes. But in reality it is, and I’ve found one of the best way to dress up a dish is to garnish it with parsley or chives. Just that pop of color adds to the “looks delicious” factor. Adding garnish is so easy and creates a visual excitement before the dish is ever tasted. I served steamed broccoli and cauliflower along with Trader Joe’s chicken fried rice with the cod (BTW, that chicken fried rice is very good and easy to prepare). The meal was a hit. A friend of mine posted on Facebook that cod has a bad rap and I tend to agree. I’m not sure why. 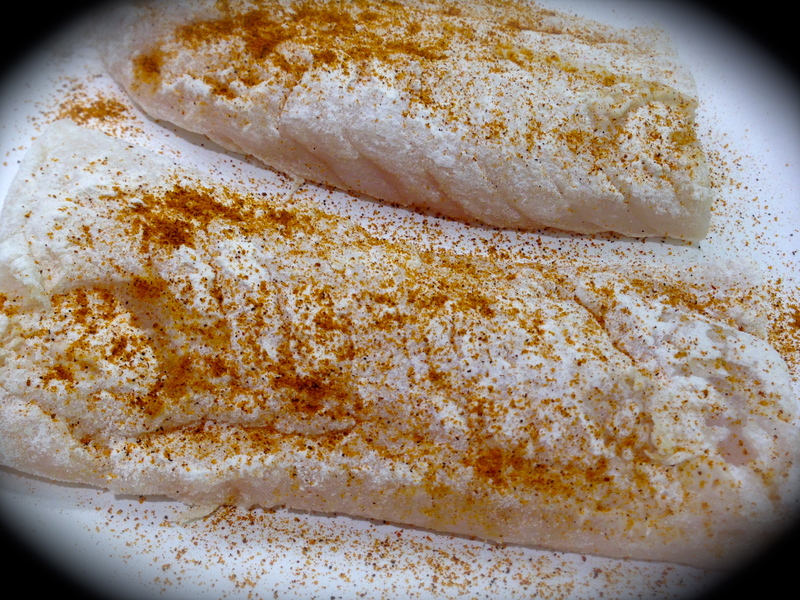 It is a mild white fish that can be prepared in a variety of ways, is complimented by a variety of seasonings and is relatively inexpensive compared to other fish. So, don’t shy away from it. 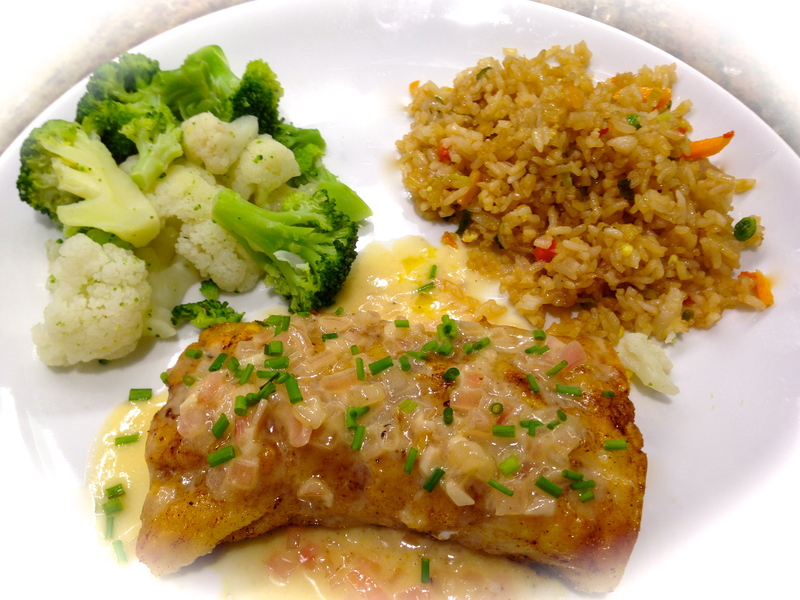 This recipe will work well for any white fish like halibut or grouper. Just make sure you don’t overcook the fish. You want the fish moist, tender and flaky. And when you add that butter sauce, well all I can say is it’s to die for! Begin by preparing the butter sauce. Heat a sauce pan over medium high heat. Add the wine, lemon juice, garlic and shallots. Cook for about three minutes or until the shallots turn translucent. Add the Worcestershire (and hot sauce if desired – I did not add hot sauce) and simmer until the mixture becomes syrupy. Stir in the cream and cook for about 1 minute. Whisk in the butter a few pats at a time until it becomes fully incorporated. Serve immediately or keep warm until ready to serve. In a large skillet melt the butter and olive oil. On a plate mix the flour with some salt and pepper. Pat the fish dry with paper towels. Dredge both sides of the fish in flour. Shake off the excess. Sprinkle the spice blend on top of the filets. 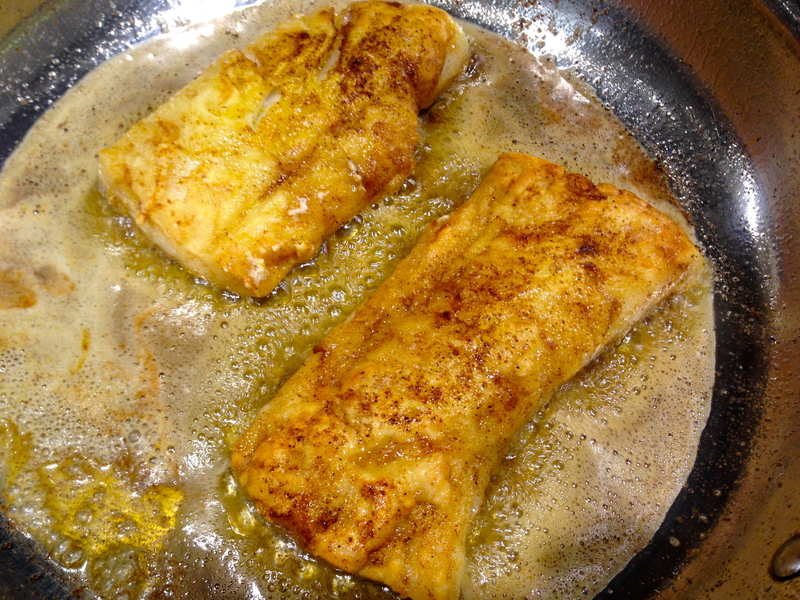 Once the skillet is heated and the butter melted add the fish seasoned side down. Season the other side with the season blend. Cook the fish for 3-4 minutes on each side. Pour a little bit of the sauce on the bottom of the plate. Put the fish on top and pour a small portion of the sauce over the filet. Garnish and serve immediately. It’s No. 1 on the “urgent to try” list. Thanks, Jan.
Let me know how it turns out – I’m sure you’ll like it! Thank you – it tastes great too! Just got some fresh ling-cod from Bodega Bay this morning and made your recipe when we got home. You are so welcome. This recipe is one of my most popular on the site. I am so glad you enjoyed it.